Business Week recently published an excellent collection of articles (by Jessica Silver-Greenberg) examining the increasing use of credit cards by college students. The series sheds light on some of the situational sources of the escalating debt loads of college graduates, one component of a wider debt and and bankruptcy epidemic. The Situationist is offering a series of posts excerpting portions of the Business Week collection. To view the first post in this series, containing numerous related links and the Youtube version of the documentary “Maxed Out,” click here. To read the second in this series, which looks at some of the ways that credit card companies recruit student debtors, click here. This post excerpts Silver-Greenberg’s article, “The Dirty Secret of Campus Credit Cards,” which illustrates the way that universities have, in part because of their situation, begun trading their reputation, group allegiances, and position of trust for increased revenues at a cost to their students. They are, in other words, charging a hidden tuition by contributing to the debt loads of their students. It was three years ago and Irene Leech still remembers the shock clearly. An associate professor at Virginia Tech who specializes in consumer affairs, she read the terms of the credit card that her school, together with JPMorgan Chase (JPM), was marketing to students, alumni, and staff. Behind the card’s shiny surface, featuring the football stadium at sunset, the so-called “affinity” card offered some of the most unfavorable terms around for card users. Among other things, the card had what’s known as “double-cycle” billing, where interest is calculated over two months instead of the typical one, resulting in higher finance charges. “I was shocked,” she says.The experience convinced Leech that it was time for her to take a stand. First in a limited way and now more broadly, she has been speaking out against the conflicts of interest that universities face when they strike business agreements with credit card companies. 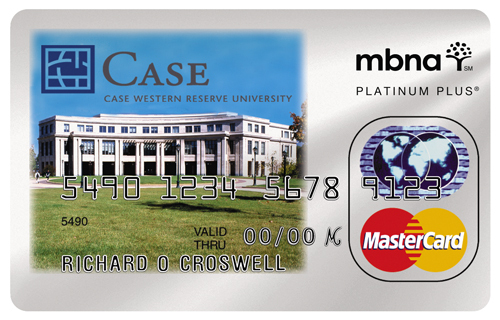 Chase ultimately dropped double-cycle billing on the Virginia Tech card, as it did for all cards earlier this year. But Leech warns that schools that get money from credit card companies through affinity contracts or other marketing agreements face intractable problems, in which the school’s financial interests are in direct conflict with those of students and alumni. Leech isn’t just taking on Virginia Tech, which takes in seven figures from the Chase deal. Nearly every major university in the country has a multi-million-dollar affinity relationship with a credit card company. The deals can be worth nearly $20 million to a single university. Schools, especially public universities supported by state revenues, are coming under increasing financial pressure to generate new revenue these days, and deals with credit card companies can provide a steady stream of income. And in most cases the worse the card terms are for students and alumni, the more profitable they are for the schools. At a time when state support for higher education has languished, these contracts have become major sources of cash for universities. The University of Tennessee, which raised eyebrows with a $16 million deal in 1998, recently signed a pact with Chase worth $10 million — roughly $384 per student at a school with a total enrollment of 26,038. If Ohio State, with the nation’s largest enrollment at 59,091, signed a similar deal, it could be worth more than $22 million. Card issuers and schools say that these relationships are mutually beneficial. With affinity cards, the schools get income that they otherwise wouldn’t, while alumni and students get the option of signing up for a credit card. The alumni association at Virginia Tech, which oversees the relationship with Chase, says its affinity card helps students and alumni build credit histories with unusually good service. “Hopefully card-users feel that they get more special care” says Thomas C. Tillar, vice-president for alumni relations at Virginia Tech. Some 20,000 people currently hold the card, including students, alumni, professors, and other staff. 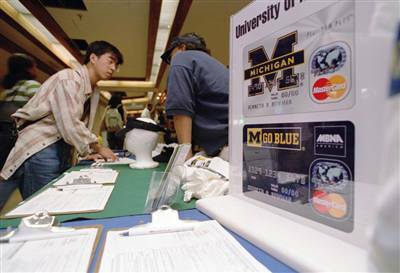 As a growing number of college kids pile up mountains of credit-card debt, the entire issue of credit-card companies on campus is coming under increasing scrutiny. Earlier this year, the state legislatures in Texas, Oklahoma, and New York voted to clamp down on credit-card marketing to college students. Congress plans to hold hearings on the companies’ practices later this year. With such efforts underway, activists say that it is inevitable that the relationships between credit card companies and universities will ultimately face greater examination. Professor Leech, with her specialty in consumer affairs, was particularly sensitive to how customers would be treated in such situations. . . .
One thing that Leech has objected to in particular is the secrecy surrounding the contract between Virginia Tech and Chase. . . . “These deals are kept very close to the chest,” she says. Only a handful of the contracts have been made public. . . . Manning [has] testified that a contract between the University of Tennessee and FirstUSA was worth $16.5 million over seven years. He also testified that the University of Oklahoma received a $1 million signing bonus from MBNA. A spokeswoman for the University of Tennessee said that its affinity card is marketed primarily to graduate students and alumni, not undergraduates. In addition, the school — which last year signed a new affinity contract with Chase for $10 million over seven years — sends the bulk of the money from such contracts to private scholarships. When so much money is at stake, Leech and other advocates worry that the schools are seeking out the best contract for their own financial interest, not the students’. “The university is not demanding consumer-friendly terms, instead they are just seeing what credit-card companies offer them,” says Leech. Tillar, from Virginia Tech’s alumni association, says that when the school renewed its affinity card contract roughly a year-and-a-half ago, it did have a choice of two banks — Bank of America and Chase. Still, the bidding didn’t allow Virginia Tech to negotiate better features on the affinity card, ensuring only that it could get a more competitive royalty package. “The bargaining is really with the royalty fee that is offered by the banks,” says Tillar. The money, Tillar says, goes toward operating costs for the alumni association. Some advocates argue that any money made from such credit card contracts should be used for financial literacy programs, to make sure students use credit responsibly. Manning has been campaigning for such programs, as well as for a reserve fund to bail out students who end up over their heads in debt. At Virginia Tech Tillar hopes to use some money from the Chase contract to provide financial literacy education, although the program hasn’t been set up yet. To view several Debt Hits Hard ads, click on the video below. This entry was posted on October 1, 2007 at 12:01 am	and is filed under Choice Myth, Deep Capture, Marketing. You can follow any responses to this entry through the RSS 2.0 feed. You can leave a response, or trackback from your own site.